When Marty Heflin did the math, he thought that the end results couldn't possibly be right. So Heflin, who's been a Nashville real estate developer and investor for almost 30 years, ran the numbers a few more times. Heflin had others at Vanderbilt University's Owen School of Management — where Heflin has taught for a decade and where he directs the MBA program's real estate focus — check his work. Heflin's analysis found that the runner-up bid for the right to redevelop the 21-acre site of the shuttered Greer Stadium near downtown, adjacent to the historic site of Fort Negley, generates millions of dollars more for Metro than the winning pitch from a group led by high-profile Nashville developer Bert Mathews, renowned music producer T Bone Burnett and Wall Street veteran Tom Middleton. "What I did was a standard technique of comparison. If it would have been close, I would have kept my mouth shut," Heflin said in an exclusive interview. "But it's pretty glaringly different." Heflin's message isn't exactly new. One source of the mounting months-long controversy over the prospect of redeveloping the property in Wedgewood-Houston is the immense gap between the proposed lease payments that the winning Cloud Hill Partnership bid and the runner-up plan, spearheaded by Dallas-based developer Cambridge Holdings Inc., would make to Metro. While Heflin is running a different calculation that reinforces that financial difference, what's more notable is that he is an experienced real estate professional publicly joining others who are questioning how Metro evaluated the competing bids — and questioning the premise Metro laid out for how it wants the site developed. Heflin's analysis also underscores that the Cloud Hill bid proposes a lot more below-market-rate residential units than the Cambridge bid, 40 percent less office space, and more community space. Those factors would stand to reduce the potential rent Cloud Hill would receive from tenants, which in turn would influence how much the group would propose paying Metro to lease the land (as would be the case with just about any real estate deal). The financial value of the proposals is likely to be a contentious point for some Metro Council members. The development deal Cloud Hill Partnership and Mayor Megan Barry's administration are negotiating will require a majority vote at the council to become final, along with approval of the Metro Parks Board, Historic Zoning Commission and Planning Commission. "Metro has not negotiated any terms of a lease with the Cloud Hill Partnership, so the financial arrangement has not been determined yet," said Sean Braisted, the mayor's spokesman. "Bert [Mathews] is a friend, and I wish him the best of luck. [He and his team] are good, quality people," Heflin said. "My whole point is, this is about the city. The city is not getting a good deal. ... If this serves no other purpose, I hope it's a warning to the city that they ought to have someone who understands real estate on the selection committees for real estate transactions." You can read Heflin's full analysis here. Heflin, who was not involved with any of the five groups that submitted bids, calculated the "net present value" of the Cloud Hill and Cambridge bids, based on financial projections the teams provided to Metro. In other words, Heflin approached the bids as a private investor would, using what he called "a very common real estate investment yardstick." Calculating net present value allows investors to compare the money various potential investments would generate, based on their preferred rate of return. The math factors in the impact of inflation, putting financial figures in current-day values. Heflin said he arbitrarily selected three profit margins for his study. At each rate of return, the Cambridge bid would have a net present value of anywhere from $8.4 million to $22 million over the lifetime of the project, according to Heflin's calculations. The Cloud Hill bid, by comparison, would range from $1.3 million to $2.5 million. Cambridge sought $7 million of public aid from Metro, while Cloud Hill sought no aid. For that reason, the seven-person panel that scored the bids granted more points to Cloud Hill in the "financial considerations" category. Heflin noted that even after subtracting that $7 million, the net present value of Cambridge's proposal remains larger. The Cambridge bid proposes 405 residential units, with 175 of them (43 percent of the total) priced as affordable or workforce housing. Cloud Hill, meanwhile, proposes a total of 294 residential units — almost all of which meet the standard definitions of affordable or workforce housing, with rents attainable for those earning no more than 100 percent to 120 percent of the area median income. "If you're trying to maximize net present value, you'd put a 40-story tower there," Mathews said. "If Metro wants no affordable housing, no workforce housing, no community retail, all at market rates, you get a different price. You can pay more for the land." Mathews added: "To pick one particular methodology does not do the comprehensive process justice. You really can’t evaluate a [public-private partnership] designed to balance economic and social/community impact on the basis of economic impact alone. But, even if you do, we believe we have a superior proposal on both counts and will reach a final agreement that provides attractive economic returns for the city." Heflin acknowledged that he is scrutinizing just one piece of what the Metro panel considered. Akin to the World War II museum in New Orleans, Heflin believes Nashville has a prime chance to create a Civil War museum around the Fort Negley site that would be a different kind of Nashville tourist attraction. If the city has decided it wants to develop the Greer site, Heflin said the city should be striving to wring the most money it can out of that deal — at a time when it is poised to potentially issue hundreds of millions of dollars of bonds to expand mass transit and finance a Major League Soccer stadium. "If you're doing that at the same time as you're selling city land, you ought to maximize the value of that land," he said. Metro hired Tennessee Valley Archaeological Research, which has offices in Nashville and Huntsville, Ala., to study the property. Braisted said the company has finished its site work and will report its findings by year's end. "This is me looking at valuation, that's all," Heflin said. "Clearly, if you're looking just at net present value, it's a no-brainer. If I'm a real estate investor and you're presenting these two projects to me, it's a no-brainer." Braisted, the mayor's spokesman, said that's the wrong way to size up the bids. 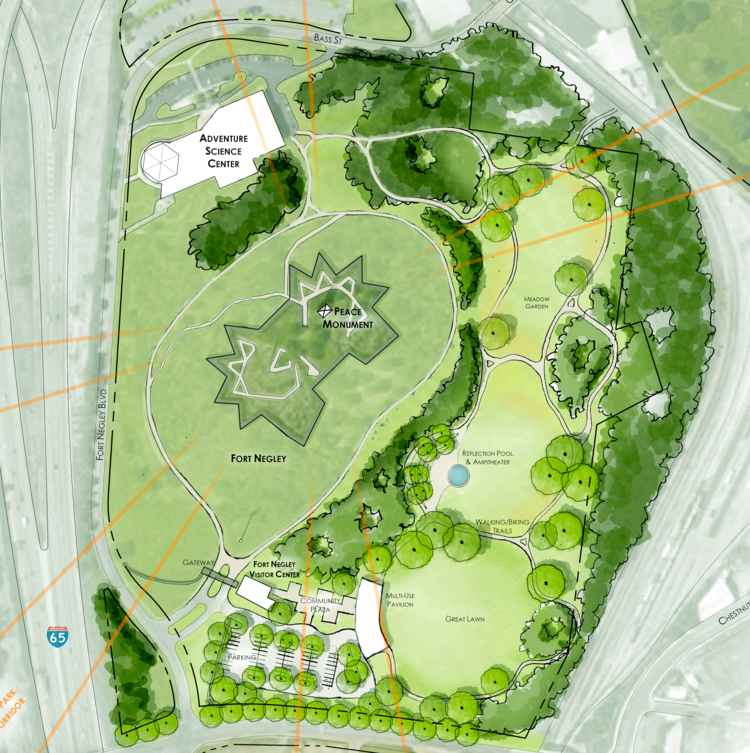 Braisted said Metro sought a project that "created public park space, greenways, affordable housing, artist-creative maker space, and honored and protected the history and viewsheds of Fort Negley. Those features and elements add value to the city in a way that a simple surplus [property] sale would not." The fort was built by slaves and other laborers for the Union Army during the Civil War. Several legal challenges to Metro's efforts are pending, and opponents to the proposed development have argued that hundreds of slaves could be buried at the site.